Arthur Li Kwok-cheung can't help himself from bad mouthing Chief Executive candidate John Tsang Chun-wah. 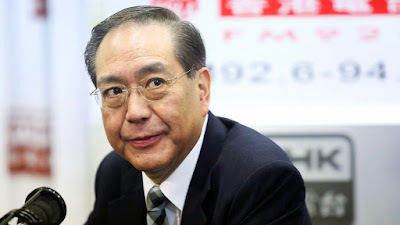 The professor who is an Executive Council member of Hong Kong and a delegate of the Chinese People's Political Consultative Conference, says Tsang gives the public the impression he is a "gentle and nice guy", but that the city's next leader had to be more than that, adding that Carrie Lam Cheng Yuet-ngor fits the bill. "Carrie is extremely hands on, very dedicated and will tackle problems. She will not shy away from difficulties. John is a very nice person, he will sit back, relax and let you get on with it," explained Li. He said having a laid-back management style was the worst thing for Hong Kong, which is facing stiff competition from Singapore, Shenzhen and Shanghai. "Executive Council members have worked with [Lam and Tsang] for a number of years and have seen how they performed. I do not think a single Exco member is supporting Tsang," said Li in Beijing. Li cited examples of how issues were handled by Tsang, such as HKTV not getting its free-to-air license, Cable TV is shutting down, and how the recently debuted food trucks in the city aren't working out well. "It's disaster after disaster after disaster," he said. While Tsang came up with the idea of having food trucks in Hong Kong, it was Secretary for Commerce and Economic Development Gregory So Kam-leung who implemented it, but less than a month in, some operators are complaining about the locations and the lack of customers. One operator has already decided to quit even before rolling out his food truck, despite having paid for it. However, Tsang has said in a previous interview that teamwork and mutual trust are important. "I rely on my people to do things because... the people you appoint are the people you should trust," he said. "If you don't trust them, why appoint them? And if you appoint them, but you still don't trust them, there must be an issue in your judgment." Interesting that Li is so outspoken and critical of Tsang -- is he a proxy for Leung Chun-ying, whom Li supported in 2012? For his loyalty, Li was rewarded with an appointment to the governing board of the University of Hong Kong, a move that was strongly criticized by academics in the institution. May we also add he is the younger brother of David Li Kwok-po, chairman of BEA Bank, and they are the grandsons of the bank's co-founder, Li Koon-chun. There probably aren't many people on the fence who need to be swayed in this three-horse race -- people on the Election Committee pretty much know who they are voting for. Maybe Hong Kong people want an easy-going guy?